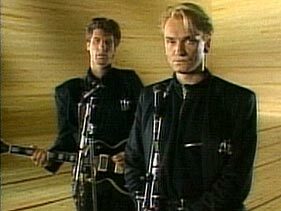 Originally know as Huang Chung, Wang Chung, the London-based new wave group, consists of vocalist/guitarist Jack Hues, bassist Nick Feldman, and drummer Darren Costin. In 1983, at the suggestion of Geffen Records Huang became Wang and success started to roll in. The bands hits include "Don't Let Go" and "Dance Hall Days" of the "Points On a Curve album. Another two Wang Chung favorites to strike it hot in the 80's were "To Live and Die in L.A.," from the title soundtrack as well as "Everybody Have Fun Tonight" and "Let's Go!" from Mosaic released in 1986. Wang Chung also received success with "Fire In The Twilight" which was included in that ever so successful soundtrack we like to call "The Breakfast Club".